Cody was bought as a jumping prospect off the track. He had a lot of talent but he was not a consistent winner. As a Shao Yang horse temperament(Fire/Wood), Cody could be volatile and unpredictable when out of balance. I could certainly see how this affected his career as a racehorse because working on Cody was like swimming with sharks. He was constantly trying to kick or bite me or his handler. He could not stand still but his movement was tight and stiff from restrictions in his shoulders and hips. Cody was not a mean horse and I don’t think he would have hurt anyone on purpose. He was just silly to be around so you had to be careful. The first thing I noticed was that Cody had a very pronounced roach back that was probably related to chronic abdominal inflammation from ulcers. Making the connection from ulcers in horses to a sore back is not that difficult. Normally the healthy intestinal outer surfaces slide on each other as the horse moves. If there is enough inflammation, the walls of the intestines become sticky and this creates a pull on the connective tissues that support the internal organs. Over time the pull is enough to affect the nerves going to and from these organs. The nerves then become irritated and fire more easily creating muscle spasms in the lower back. Shao Yang horses have a tendency to digestive problems when stressed and poor Cody had been having these issues for much of his life. The organs associated with Shao Yang are the Gall Bladder and Triple Heater. The gall bladder is associated with digestion, especially the breakdown of fat. The proper secretion of bile is also important to buffer the stomach acid coming into the small intestine from the stomach. I wanted to get Cody on a low fat diet such as Kool and Kalm and support his gallbladder with dandelion root herb. I also wanted to give him prebiotics in the form of KLPP and soothe his digestive system with slippery elm bark or marshmallow root. The Triple Heater is not exactly an organ, but in Traditional Chinese Medicine it is responsible for the flow of energy from the upper part of the abdomen to the lower part. To balance the Triple Heater I used acupressure point BL 22, the association point for the Triple Heater. Ulcers in horses can also cause tight shoulders so I used TH 15 as a point to relieve this problem for Cody. GB 34 was used to relax muscle spasms and to help regulate digestion. GB 24 was used to support this action. BL19 was used as it is the association point for the GB and a local point along with BL 22 for the tight back. Over the years Cody has been maintained on this program. He has lost much of the roach in his back and his shoulders are much more free. Cody is still prone to colic if his program is changed but these episodes tend to be mild. Cody is still a handful but his antics now are more in sheer exuberance. 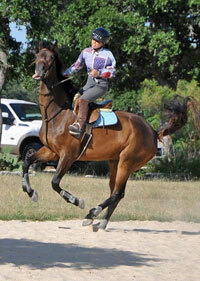 Cody has had a very successful show career and now is ridden by some experienced young riders.